Lamin A is not essential for a healthy mouse. 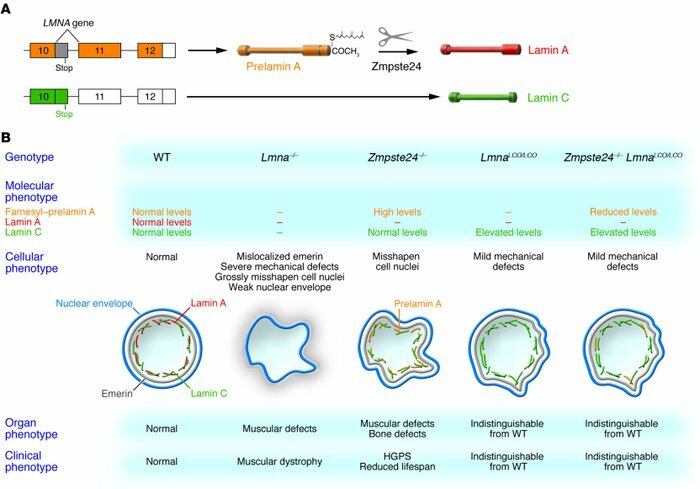 (A) Lamin A and lamin C are generated by alternative splicing of the LMNA gene. Use of a donor splice site within exon 10 generates the prelamin A protein, which is then modified by farnesylation and subsequently cleaved by the Zmpste24 endoprotease to produce mature lamin A. Skipping of the exon 10 splice site generates lamin C. Due to the presence of a stop codon in exon 10, lamin C lacks the posttranslationally modified C-terminal region. (B) Comparison between cellular and organismal phenotypes in different mouse backgrounds.